Home » » The Unicorn of the sea, Narwhal. The narwhal with a large "tusk" from a protruding canine tooth is a medium-sized whale (Monodon monoceros), whose IUCN red list status is "least concern". It lives in the Arctic waters around Canada, Russia and Greenland. Males are distinguished by a long, straight, helical tusk, which is an elongated upper left canine. It is often called the unicorn of the sea. Its total body size can range from 13 to 18 ft; the males are slightly larger than the females, with an avaerage adult weight of 800 to 1,600 kg. The pigmentation of narwhals is a mottled pattern, with blackish-brown markings over a white background. They are darkest when born and become whiter with age; white patches develop on the navel and genital slit at sexual maturity. Old males may be almost pure white. Narwhals do not have a dorsal fin, possibly an evolutionary adaptation to swimming easily under ice. The tail flukes of female narwhals have front edges that are swept back, and those of males have front edges that are more concave and lack a sweep-back. This is thought to be an adaptation for reducing drag caused by the tusk. 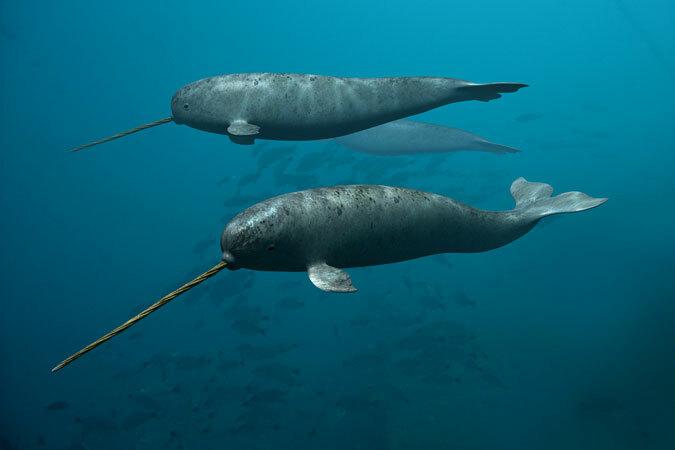 Narwhals can live up to 50 years. Mortality occurs when the narwhals suffocate after they fail to leave before the surface of the Arctic waters freeze over in the late autumn.